Retouching Varnish for Restoration — A fast-drying light mastic varnish for retouching and restoration. The finish is moderately shiny, and will not yellow. Glass bottle with twist-off cap. Picture Varnish — A final varnish combining the flexibility and hardness qualities of its components. It can also be used for other mediums. It is made with synthtic acrylic and ketonic resins and a mineral spirits base. Glass bottle with twist-off cap. Retouching Varnish — A light final varnish. It's suitable for treating matte areas that form while painting before applying another final varnish. It has a medium drying time. Minimal gloss. Glass bottle with twist-off cap. Concentrated Mastic Varnish — A natural, valuable antique varnish for traditional use. Very flexible, it can be used as an addition to restoration colors. Dammar Varnish — A traditional final natural vanish, Maimeri Dammar Varnish imparts greater brightness and shine to colors. Glass bottle with twist-off cap. Patina Varnish — Creates an amber finish, giving your painting an antique look. It's used as an undercoat for the picture cracking varnish and will yellow over time. Glass bottle with twist-off cap. Mastic Varnish — Flexible and elastic, it gives brightness to a painting. It will yellow over time and is reversible. A very valuable natural varnish of antique tradition. 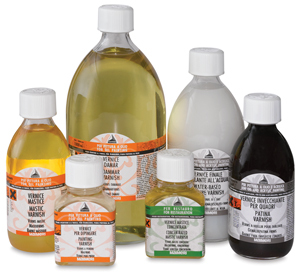 Acrylic Picture Varnish — Maimeri Acrylic Picture Varnish is an easy-to-apply non-yellowing, finishing varnish. It has a UV filter that makes this finish very suitable for outdoor painting. Glass bottle with twist-off cap. Picture Cracking Varnish — Maimeri Picture Cracking Varnish is a ready-to-use amber solution that gives paintings and other objects an antique, cracked look. Brush over a surface treated with Patina Varnish. Once the cracks are formed and blackened, apply another coat of Patina Varnish. Temperature and humidity will affect the size of the cracks. Glass bottle with twist-off cap. Painting Varnish — Prevents uneven drying, and produces bright tones. It increases the adhesion to the surface and the flexibility of colors. Glass bottle with twist-off cap. Picture Varnish, Gloss — This glossy, non-yellowing varnish based on ketonic and acrylic resins, contains a UV filter and is reversible, provided that the painting has fully dried before varnishing. It can be mixed with the matte varnish. Picture Varnish, Matte — This matte varnish, based on acrylic resins, contains silica for iridescent effects. It is reversible, provided that the painting has fully dried before varnishing. It can be mixed with the gloss varnish to produce a range of effects. Do not apply a matte varnish to absorbent surfaces, to areas where the paint film has oiled out, unless they have previously been treated with insulating varnish. Water-Based Picture Varnishes — Use this water-based varnish with acrylic or oil paintings as an alternative to traditional solvent varnish. Easy to apply, it enhances the brightness of colors, and won't yellow with age. Glass bottle with twist-off cap.